Today's topic : EMBARRASSING ENCOUNTER. Today we discussed those unpleasant moment we experienced in life, how to handle it and get over it. The Morning Drive Show With DerbieDiva is a wake up show designed to prepare you for the day. 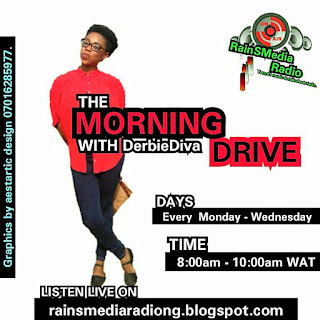 Join DerbieDiva has she brings you tips on how to start your day on a brighter note. Tune in every Monday through Wednesday from 8:00 am to 10:00 am WAT ( West Africa Time); only on RainSMediaRadio... your #1 music and talk show radio.